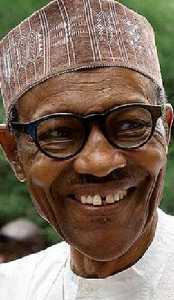 Muhammadu Buhari is the current President of Nigeria. The former military General and former president of Nigeria under the military era has been in power since 2015. This article contains the current estimated net worth of Muhammadu Buhari this year and some other quick facts such as his biography and some other facts about Nigeria's president that you probably never knew. Q: Muhammadu Buhari Quick Facts? 1. Muhammadu Buhari was born in Daura,Katsina State,Nigeria in 1942,he rose too the rank of a Major General in the Nigerian Army before retiring,he was also the former military head of state from 31 December 1983 to 27 August 1985. 2. He is the 15th President of Nigeria,he took over power from president Goodluck Jonathan,he assumed office on the 29th of May 2015 with his vice president Yemi Osinbajo.Buhari's political party is the All Progressives Congress (APC). 3. Buhari has 10 children and 1 grandchild,his first wife Safinatu Yusuf that he married in 1971 bore him 5 children,he divorced her in 1988 and married Aisha Halilu in 1989,she also had 5 Children for Buhari. Safinatu Buhari died in 2006,while Aisha Buhari is the current first lady of Nigeria. 4. Muhammadu currently has 8 surviving children they are Yusuf,Zarah,Amina,Hadiza,Safinatu,Aisha,Halima,Fatima,he lost Zulaihat and Musa. 5. He attended the Nigerian Military Training College,Mons Officer Cadet School and the U.S. Army War College. He served under the Nigerian Army from 1961 to 1985 and reached the rank of a Major general. 6. Buhari keenly contested for the office of president of Nigeria in the 2003, 2007 and 2011 general elections but he lost,however he won in the March 2015 general elections. 7. The Buhari led government has been heavily criticized for some of it's policies,the Nigerian economy slipped into recession after he took office,millions of Nigerians also lost their jobs. There has also been an increase in insecurity in Nigeria. 8. The president has also been critic known for his routine medical check-ups in the United Kingdom for an undisclosed ailment. 10. The Buhari led government in 2016 through the government’s Federal Ministry of Finance announced a whistle blowing policy with the aim of fighting corruption. Q: Muhammadu Buhari Current Net Worth? N30 million Naira to his name. One bank account with Union Bank. 5 homes, and two mud houses in Daura Katsina. 2 undeveloped plots of land located in Kano and Port Harcourt. Farms which include an orchard and a ranch. 270 heads of cattle, 25 sheeps, five horses, a variety of birds and a number of economic trees. Cars which include two which he bought from his personal savings and the others given to him by the federal government as a former Head of State. The rest of his cars were donated to him by well wishers. Shares in Berger Paints,Union Bank and Skye Bank. Muhammadu Buhari is estimated to have a current net worth of $50 - $80 Million Dollars. This figure is just an estimate and has not been verified by any credible source.